« I Finally Bought My Cricut Machine! Now what? 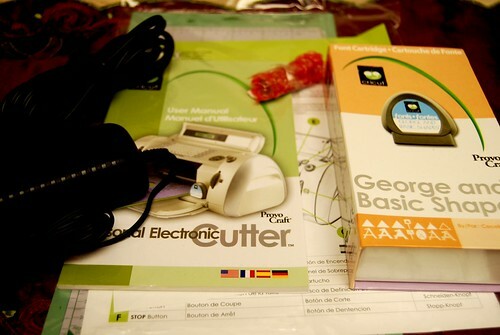 I couldn’t wait any longer, I went ahead and opened up the Cricut and what follows is a typical unboxing blog post. 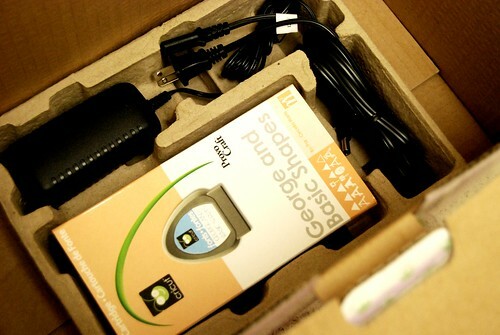 You know, when a blogger gets a new toy and walks you through the unboxing? 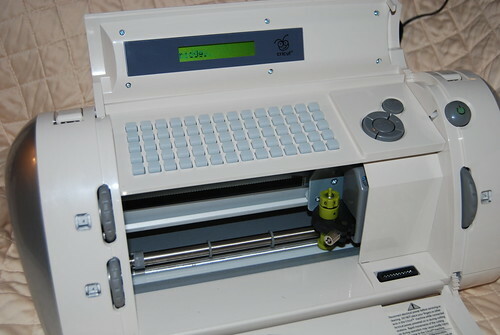 I’ve never done that before, but since I’m assuming there are people out there like me, that have debated getting a Cricut and need some convincing to finally take the plunge, consider this a public service. I wish I had read a post like this prior to opening my Cricut and a quick search did not give me any results. So basically. I am writing this as I would have liked to have seen it. I hope you enjoy. 🙂 You may want to skip this if you have no interest in scrapbooking or Cricuts. WARNING! SUPER LONG BLOG POST AHEAD! 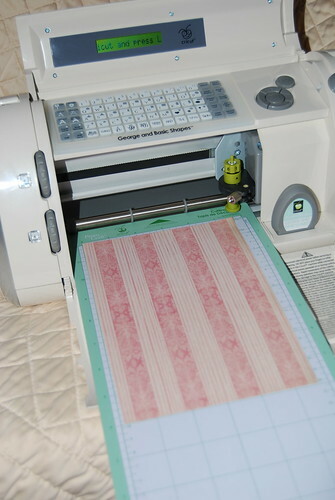 As you may remember from the previous post, I bought my Cricut on sale, while already in line to pay. Meaning, I didn’t buy it with any extras or any additional items. I was already next in line to pay when the Cricut found me! So as I’m opening the box, I see this label with suggestions of what you might need. I wondered if any of these items would be crucial to using the machine for the first time, but as it turned out, I did okay without them. However, with more frequent use, I can see how these do become essential items. 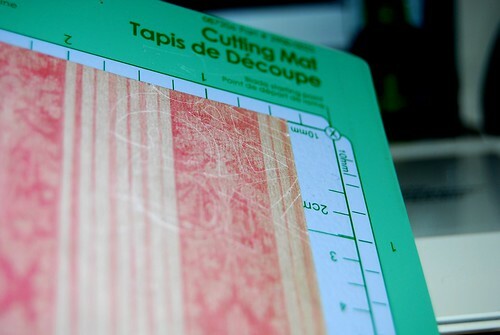 You might as well buy cutting mats and blades in bulk. TruFax! A quick search on Amazon tells me that a set of two 6×12-Inch Adhesive Cutting Mats only costs like $7! At this point (I guess I’m impatient or something) I just wanted to get the machine up and running so I unpacked it. 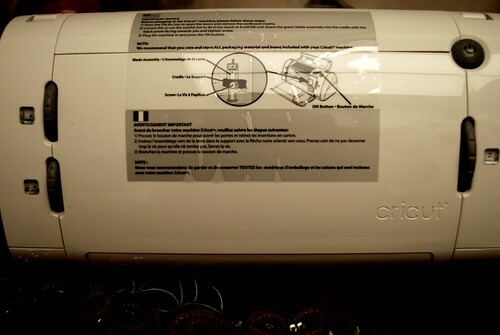 The clear label that you have to remove to open it tells you how to get it turned on and install the blade. I found that the instructions on that little label helped me so much! 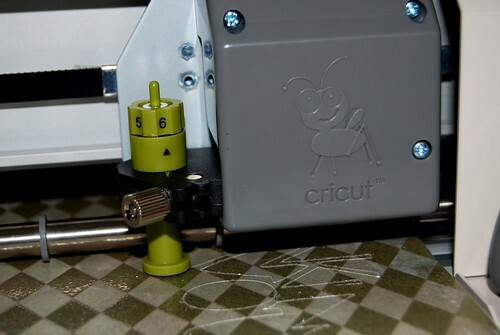 The little plastic cling also tells you to remove the cardboard once the Cricut is open. At this point, I moved the location of the Cricut machine and opted to use the flash on my camera. As you know, I don’t like using flash, but in this case, I felt it was valid. Next, it tells you to install the blade. Just unscrew the blade holder, put in the green blade, and tighten it up again. Sounds easy, right? 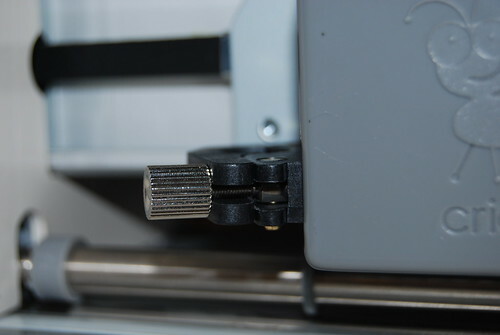 With the blade installed, I turned on the machine and then realized I had no cartridge installed. D’oh! So I found the box with the cartridge and opened it up. The packaging is super nice. 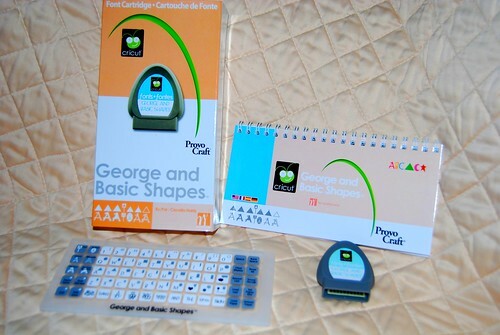 It comes with a keypad and a spiral booklet with instructions and pictures of all the different things you can create with just this one cartridge. So you place the keypad right over the blank buttons on the machine. That was super cool! 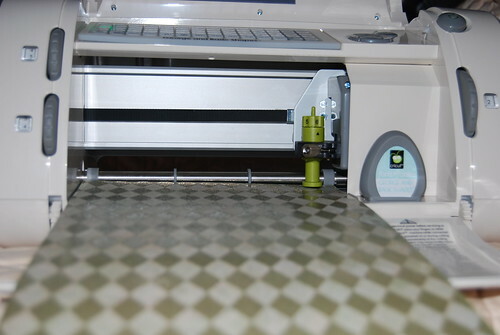 Already I was amazed by my Cricut even though I hadn’t made anything yet. 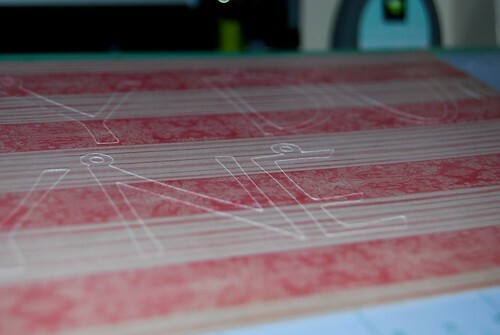 Finally I cut some 12×12 paper down to size, stuck it on the sticky map and pressed “load paper” on the machine. It all seemed very simple at to this point. As you can see on the keyboard, there are some buttons that already have a phrase, however I wanted something a little more personal, so I typed in “LADY DUCAYNE” all in capitals because…well…um…I didn’t know how to make some of the letters lowercase. Don’t judge. Lulz! 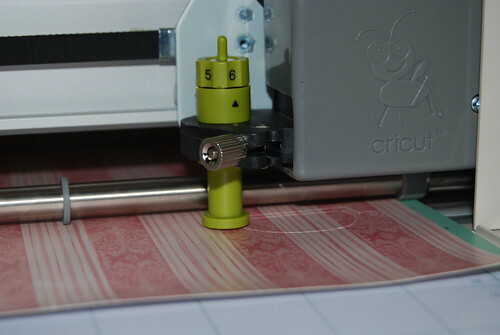 So I press the big round button to indicate that I want my Cricut to start cutting and oh, it started cutting all right. It started cutting right onto the mat! Noooo! I didn’t align the paper all the way to the edge so it actually started cutting the “L” on the spot where there wasn’t any paper. I didn’t know how to cancel it so I just let it go on figuring eventually it would move on the paper itself. And, well it did, eventually…You will also notice that the blade is on 6. My paper was a bit thick so I wanted to make sure it cut deep enough. After getting over the trauma of seeing the blade actually cutting on the mat and thinking I was doomed, I unloaded the paper by simply pressing the button and saw that some of LADY DUCAYNE was actually on the paper! Pretty cool! 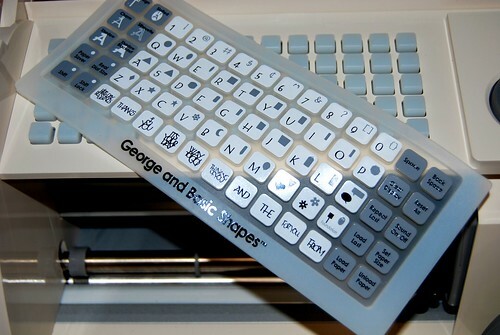 I also happened to press one of the font options on the keyboard to make the letters look extra neat. Almost like ornaments. 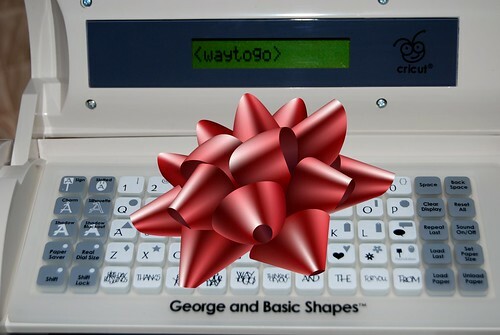 Now, in my days of lusting after a Cricut I became familiar with some of the tools that people use and one of them is a little tool that helps you separate the letters that have been cut out. I’m telling you, it would have helped me a lot! 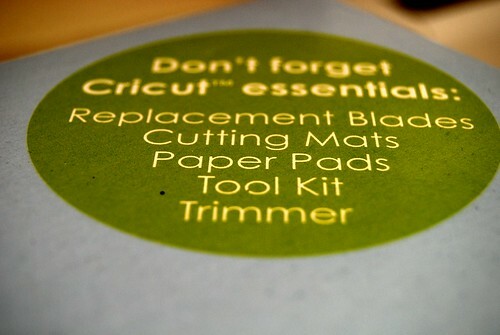 A quick search on Amazon revealed that the Cricut Spatula Tool is only $5! What! At that price, I might as well buy two! 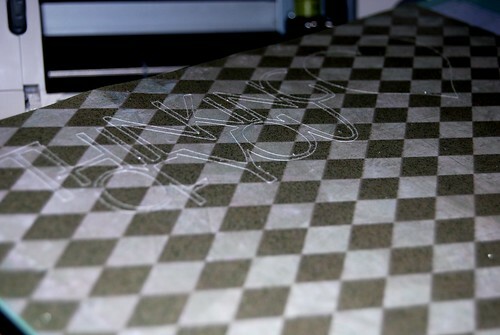 But, at this point, I don’t even have one, so I used my fingers and bent the mat to get the extra parts peeled away. 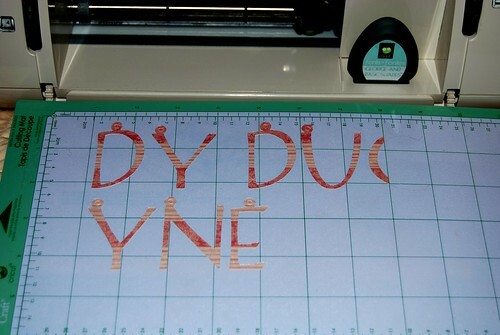 This is how much of LADY DUCAYNE actually ended up being cut out, the first time I used my cricut. I’m thinking that was pretty good for not even knowing how to properly use it, amiright? With my newfound confidence, and the fact that the mat was still completely usable (ay, ay, a scratch, a scratch; marry, ’tis enough. Where is my page? Go, villain, fetch a surgeon!) I decided to give it another go, only this time I cut a 12×12 sheet of paper to cover as much of the mat as possible. I also simply pressed the button that said “Thinking of You” because it was getting late, and I figured I couldn’t mess that one up. Then just because, I also pressed the button that featured a heart shape. As the Cricut got to work, I could see that this would be a success! How simple was THIS! Excellent! After it stopped cutting, I simply hit the unload paper button and ended up with this! 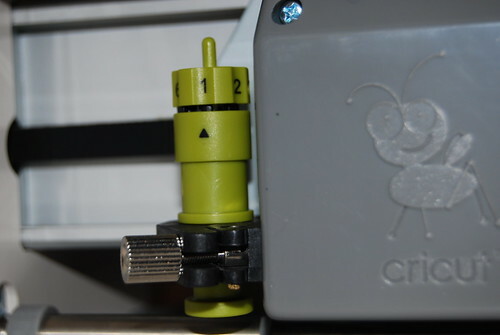 I forgot to mention that the dials on the side of the Cricut are meant to indicate how big you want the letters to be, and you can also indicate the size of the paper. I didn’t mess with them too much because at this point I’m still unsure about a lot of things. 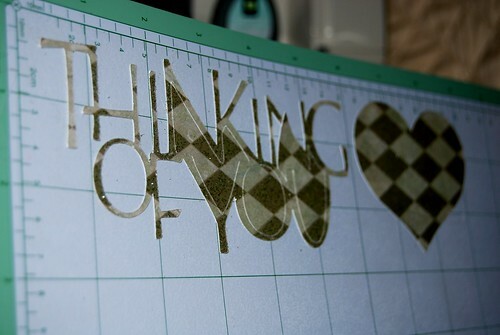 Once again, I got to work separating the THINKING OF YOU sign from the paper and was pleased to see that it came off as one whole piece! Very cool! This is what it was starting to look like after a minute or two (or three) of separating it. 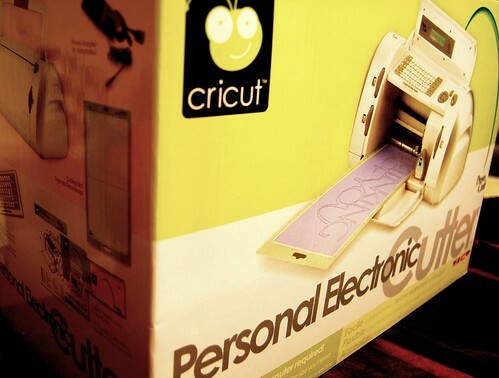 Do I love my Cricut? Yes! I definitely need to practice a lot more and possibly crash a Cricut party (I’ll bring pretty paper) so I can learn how to use it a lot more. I’m not too clear on what to do so that it doesn’t cut onto the mat, even when the paper isn’t big enough to fill the whole space. However, I can already tell that this is definitely one of the best gifts ever! 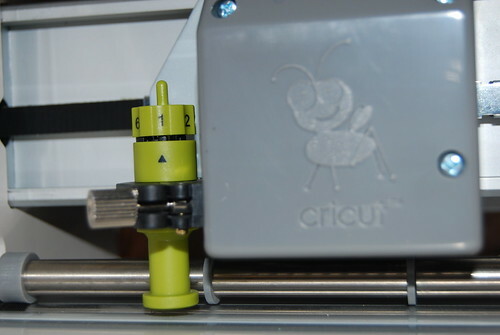 By the way, the Cricut I bought is the small one. 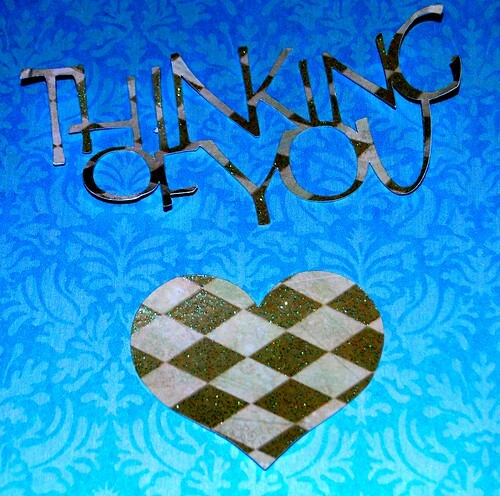 If you like to scrapbook and make personalized cards, then I say go for it! I look forward to learning how to use it and integrating it into classroom projects. I also plan on buying some more cartridges little by little so that I can make a greater variety of items. Seriously, there’s a cartridge for just about anything! I have also learned about something called a Jukebox which basically lets you have more than one cartridge attached to your Cricut at once. Love it. Thank you so much for this. It wil help me a lot. 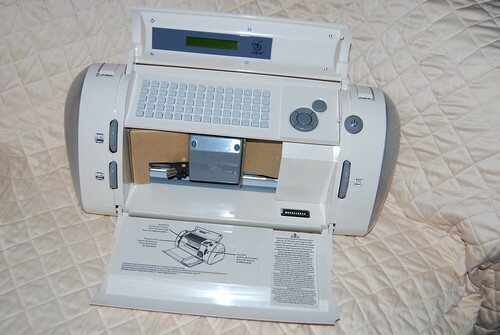 Ok, here’s the deal, it is Memorial Day weekend….I purchased my Cricut right after Christmas, rockin deal at Wal-Mart, anyway, I have yet to open it…but today’s the day. I have been, like you looking for info on the net. I think I am finally ready, even purchased the Sure Cuts Alot software, even though I viewed it on-line every other day and when it finally became officially unsupported and the price almost doubled…then I bought it, had to have it before it got away. Anyway, my hope and plan is to cut applique pieces with cute material that I will use to embroider on various items.